Nelsan Ellis almost didn’t find the Juilliard Drama School because he kept misspelling the search term. Somebody in his Chicago high school told him he should go there. That somebody was right. Ellis not only found Juilliard (with the help of spell check), he also auditioned, attended, graduated, and is currently playing the stand-out Lafayette Reynolds character in the Emmy Award-winning HBO series True Blood. Ellis can also currently be seen playing Martin Luther King, Jr. in Lee Daniels’ movie The Butler. But because he was once just a kid of color with dyslexia, all of that almost didn’t happen. Young Nelsan almost ended up an educational discard. Fortunately for Nelsan, his second-grade teacher was as interested and informed as his first-grade teachers had been ignorant. His second-grade teacher told him he had something called dyslexia. She pulled him out of PE so he could learn to read. Together, every day, while the other kids went to gym, they started all over again from the beginning in both reading and math. Nelsan remembers finally starting to read (or at least memorize) words using beginner books. He credits her with saving him from the stigma and dead end of Special Ed. But she would be the last of his insightful early help. Ellis’ family was too poor for him to even dream of private programs or tutors, and no one told his grandmother he had a legal right to less restrictive help from the local school district. Despite the tutoring from his second-grade teacher, schoolwork took so much longer for him to do than the other kids, and young Nelsan continued to think he was retarded. But something in Nelsan Ellis refused to give up. He taught himself to work harder and longer than everybody else. He came from a dirt-poor hardscrabble world, and he didn’t want to wind up in one as an adult. He’d learned from his grandmother that “If you are gonna be something in life, you gotta do it yourself.” So he suffered through his schoolwork. In his neighborhood, however, an African American teenage boy who hit the books was a target for bullying. So, at fifteen, his grandmother sent Nelsan north to live with an aunt in Chicago. Nelsan started thinking he should go to college. He was surprised to hear there were conservatories for actors and artists. He didn’t really know how or when–but he knew he belonged at one. His dictionary became a close friend, and he worked hard for good grades. After a brief stint in the Marines, he made the leap to Juilliard and became a professional actor. True Blood enters its seventh and final season next summer on HBO. 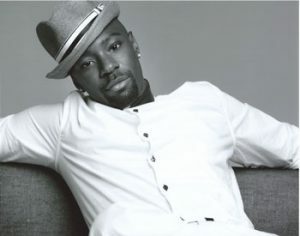 Nelsan Ellis returns as Lafayette Reynolds, a human in a cast of vampires, shape shifters, and Halflings–a flamboyant, but very masculine, gay prostitute, short order cook and medium—whom Ellis manages to play without stumbling into any stereotypes. That takes talent. So do decoding and comprehending script pages as an actor with dyslexia. Ellis says he can’t read and act at the same time. If he is auditioning and the director changes the script, he needs time to study the lines and return the next day. It takes Ellis three hours to read a script that most actors blow through in 45 minutes. His brain, he says, rolls combinations of words over and over until it decodes a clump into something comprehensible. And it is still mostly the little words that trip him up. But once he comprehends, his understanding of the material is always original. Nelsan’s writing is slower than his reading. He’s long since finished writing his first play, but he’s been adapting the screenplay for ten years. He hopes his future holds the titles of film writer and director as well as character actor. All three jobs rely on observation and empathy for human nature. Nelsan’s dyslexia has only deepened his empathy for people who struggle in life. And he offers encouragement to others: “It’s no fault the way people turn out. All of us are different. If someone rises to the occasion of their disability and conquers it, instead of using it as an excuse, I have huge respect for him or her. You are the master of your own ship. Steer it! You are the one who has to go out there and claim your own future. It just requires more work.” And maybe Google—with spell check. She’s an Academy Award-winning actress, comedian, radio host, and television personality. She is one of the only ten people to win an Emmy, a Grammy, an Oscar, and a Tony Award; and is the first woman to be honored with the prestigious Mark Twain Prize for American Humor. At 64, self-made Hollywood mogul Brian Grazer has produced movies and television shows that have racked up 43 Oscar nominations, 138 Emmy nominations and grossed $14 billion. Just a few of his greatest hits include Apollo 13, Arrested Development, American Gangster, 8 Mile, 24, Frost/Nixon, Friday Night Lights, The Da Vinci Code, Parenthood, and the new show, Empire. Jay Leno has been making humor out of headlines and everyday life since he was a kid. Even after his last night as the host of The Tonight Show with Jay Leno, a job he held for more than two decades, Leno plans to continue to perform in comedy venues across the country. Fred Newman is an award-winning sound artist, actor, producer, comedian, and author. Newman is one of the two people behind the sound effects that bring Garrison Keillor’s radio program A Prairie Home Companion to life. He’s been the voice of Harry in the movie Harry and the Hendersons, and also created sounds for other movies, including Who Framed Roger Rabbit, Practical Magic, and Gremlins, among others.